I must admit, I have been lazy. Just tie the spoon on and fish! Over the last few weeks I have been comparing doing it the lazy way, or putting on a swivel or a snap swivel on the line. I am convinced that a swivel and a spoon is the way to go! Last Saturday I was fishing in the Boise River. It is very low and clear right now. I was able to see the action of the spoons and the response of the trout. Many times I was sight fishing. In my opinion, you get a better wobble with a swivel. You also protect your line. I was fishing with Japanese 2 pound test line. I caught more fish with a swivel than without one. I know that is subjective, but I think the biggest reason is the current that pulls on the line doesn't affect the spoon action as much. I wish I could say it better. The spoon can wobble independent from the line. 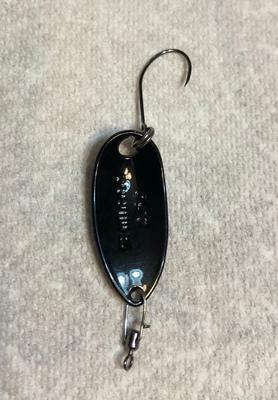 The Shimano Roll Swimmer Spoons, really work well in the colder water! The Black in the picture accounted for about 75% of my fish last Saturday. I caught all planted rainbows and one nice 12 inch brown. The Cultiva Micro Snap Swivels are worth every penny. The ones I bought at Cabela's are junk in comparison. Both spoons in the pictures cost the same. You can see the quality difference in the JDM spoon over the American spoon. Actually having to replace the hook makes the American spoon more expensive. 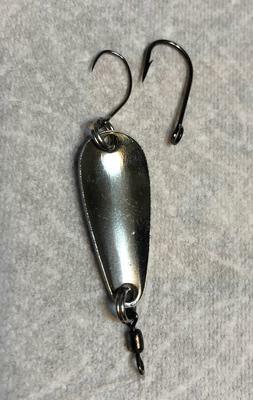 The Cultiva hooks are exceptionally sharp! Hook sets are simply a wrist snap. With the quality rods that Chris has for us here, it is easy to keep the proper tension on the line to land the fish. I only lost two fish Saturday out of about 20. I doubt that it was because of being barbless. So I would encourage you to put some swivel in your spoons. I think you will find they work even better, and protect your line as well. Thanks, I may have to try them next time I place an order with Chris. Would make swapping colors when I want to test much faster. Hi Les, I too like the Micro snaps that Chris sells and not only use them on spoons but plug and spinners, too. Did you find any better action using the snap directly to the hole in spoon or to the split rings? Unfortunately, we are all froze up, have been for almost 3 weeks so no open water fishing till April sometime. Rolfe - Nice to hear your experience on the Boise River. They continue to improve the quality of the waters and are protecting this great Urban fishery. I have not fished the sections that you fished! I fish between Eagle Road in Meridian down to Middleton. I never did get further west where the really good smallmouth fishing is suppose to be this year. It would be nice to hear a little about fishing in South Africa. I spent a year in Benin, West Africa. I was able to do some fishing, but we always were on the alert for crocodiles. Kelly - I have not been able to detect that much difference between if I have a split ring or not. On the Daiwa Vega spoons, I don't use a split ring. Do you do any ice fishing? I always enjoyed ice fishing in Wisconsin. I do like being able to change spoons quickly having a swivel.